Spring is here in central Texas! While the weather can still be unpredictable, for the most part the cold days are behind us. Texas cold that is. As the days get longer and the temperatures start to climb into the 80s everything starts to get a lot more frisky. Especially the fish in our local waters. Fishing on the Colorado River has been good for a while. 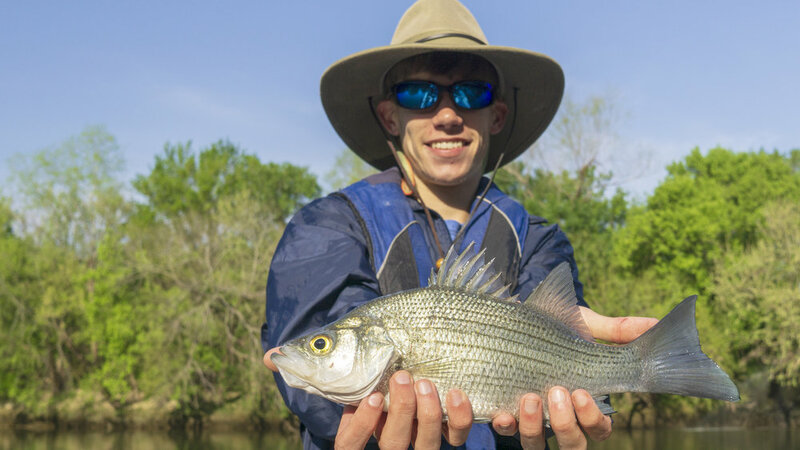 White Bass, freshwater drum, Guadalupe Bass, Largemouth Bass, and even a few Buffalo have all been caught on the Colorado in the last couple of weeks. 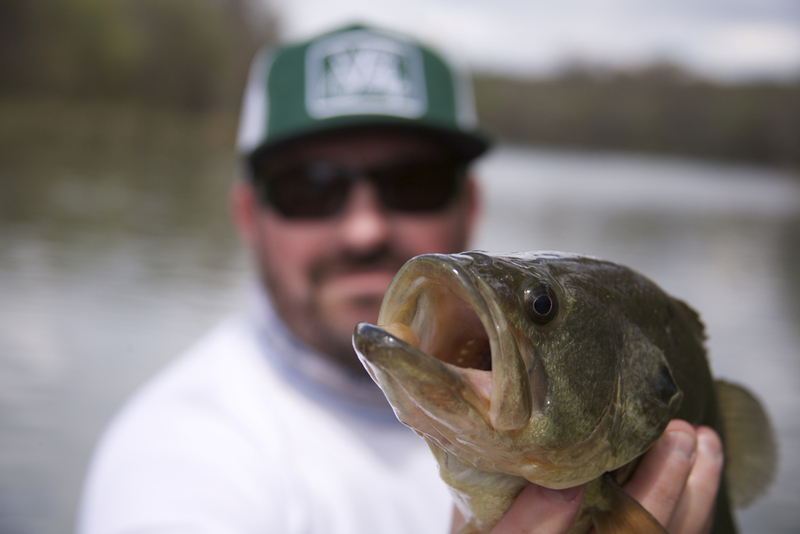 A few folks have been lucky enough to catch some bass on top. 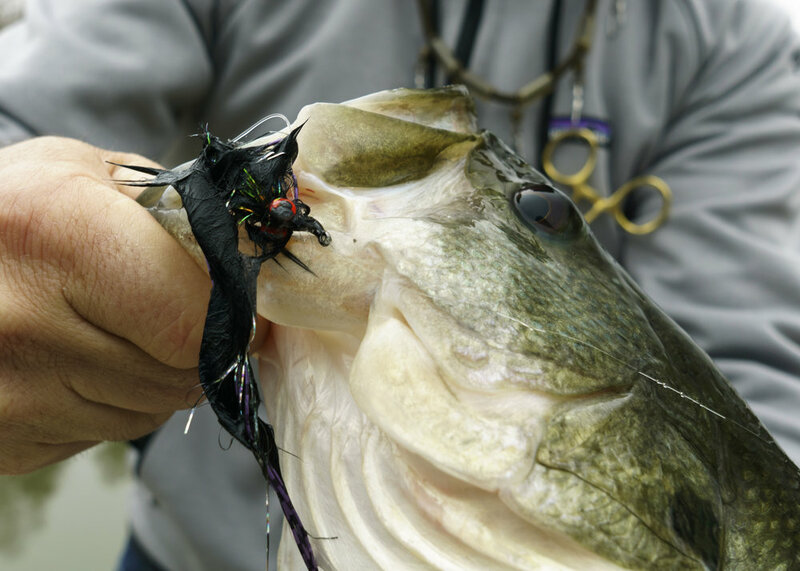 As the water temperatures continue to rise topwater fishing will turn on more. 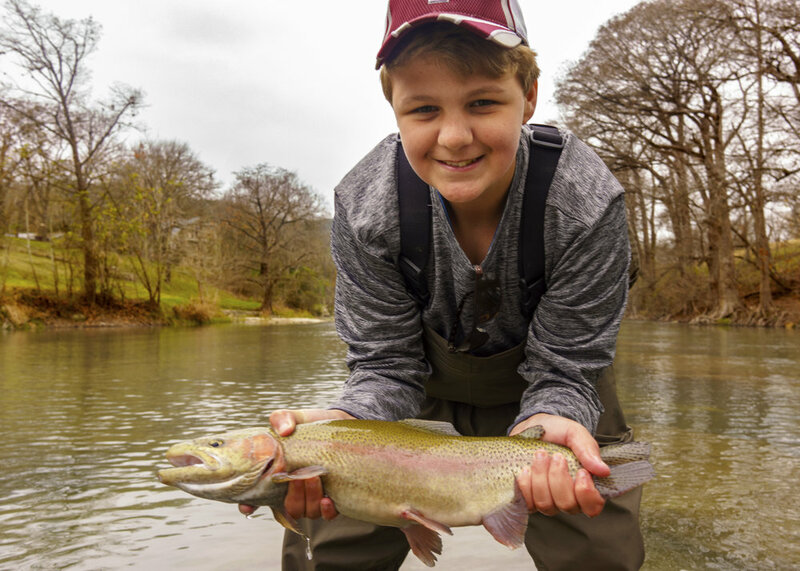 Because of the higher flows this winter on the Guadalupe River, trout fishing continues to be good. Fishing should continue for at least the next few weeks. Early morning half day trips will be the best bet as temperature rise. 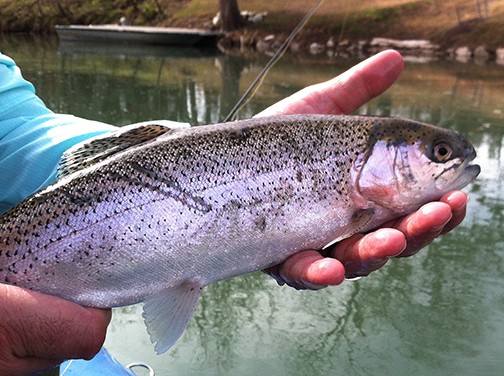 Trout fishing will start to tail off as the recreational (tubing) traffic increases. 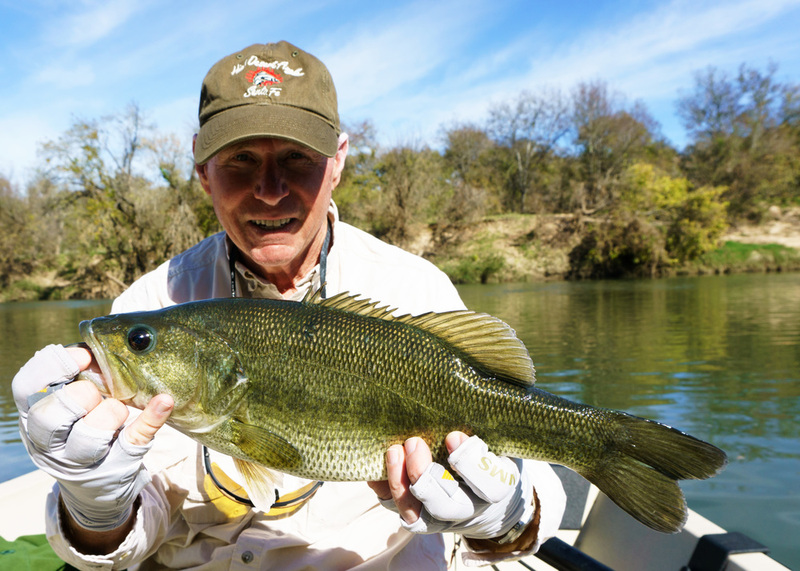 All in all this year has been one of the best seasons on the Guadalupe in years. Coastal fishing can be pretty awesome this time of year as well. 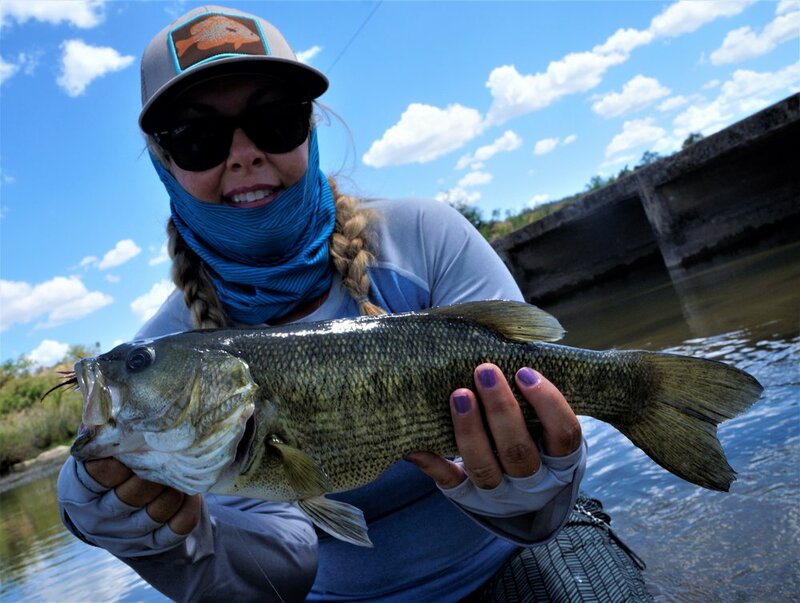 The spring is known for windy days down on the coast, but if you are flexible with your fishing days you can have an amazing time in the salt in the spring. 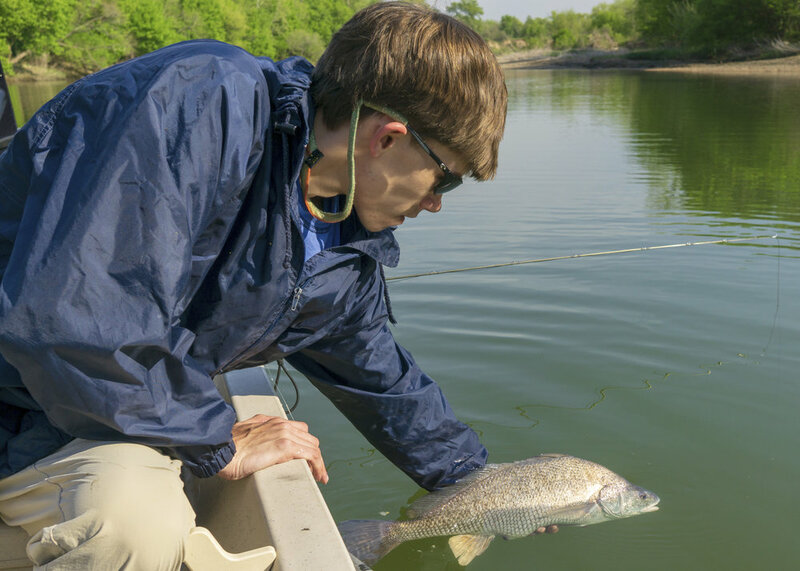 Redfish get pretty frisky when the water starts to warm in the spring. Just keep an eye on the weather and be ready when the wind dies down. So now that you know what’s going on out there, grab your gear and hit the water. No April fooling around here. Spring in Texas is the real deal. Winter in central Texas is never a dull time of year. Monday's high can be in the 20s and it can be in the 70s by the weekend. 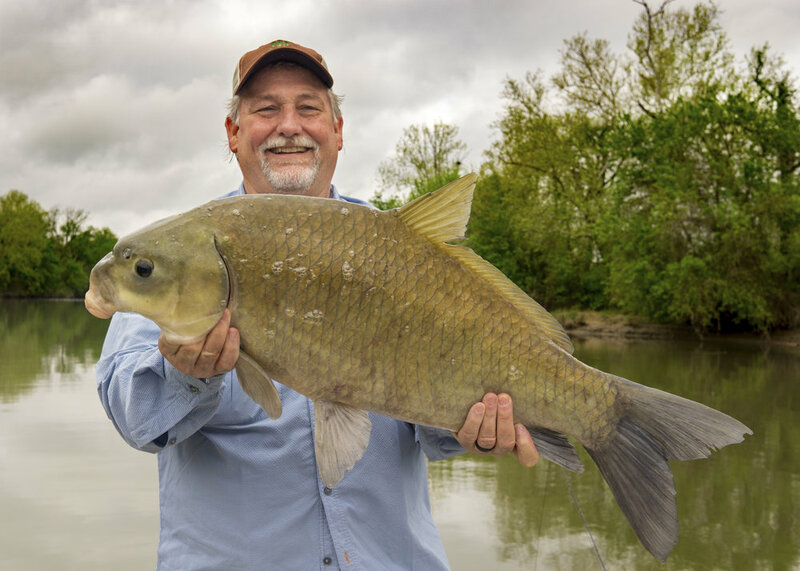 Our fishing this time of year can be just as varied. 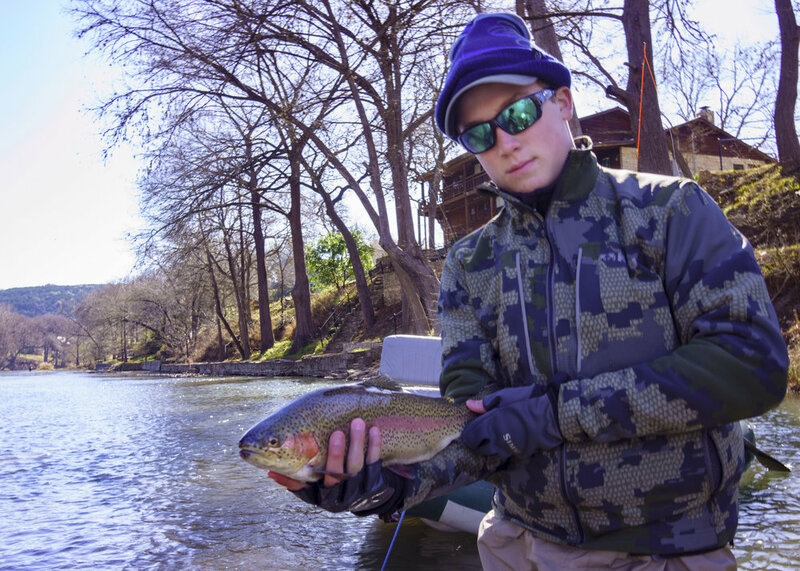 Here are a few options for winter fishing in central Texas. 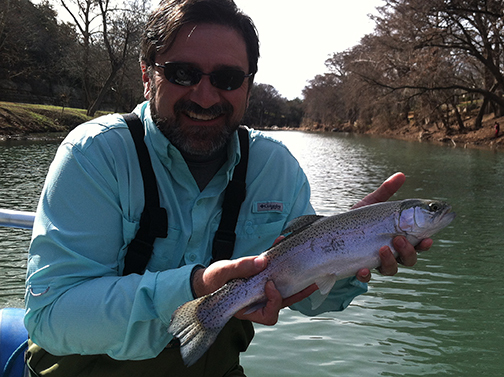 Guadalupe River trout fishing. 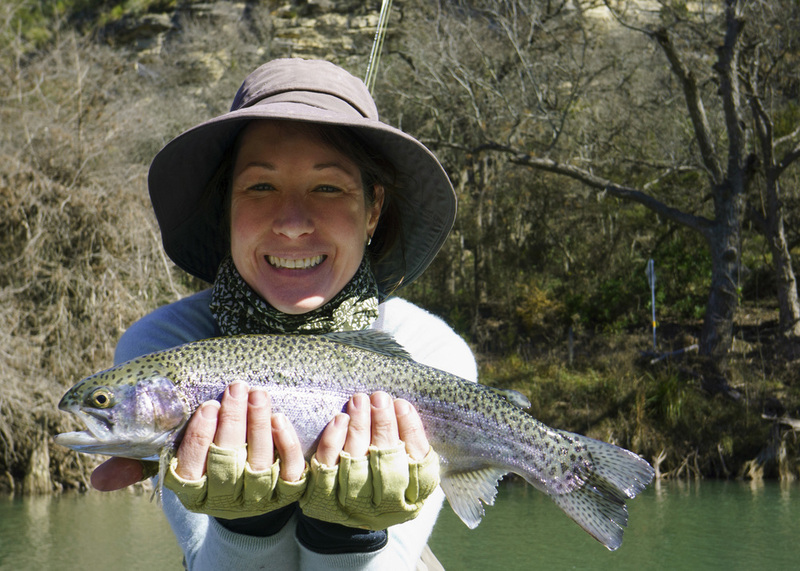 The Guadalupe River is the southernmost trout stream in the lower 48. 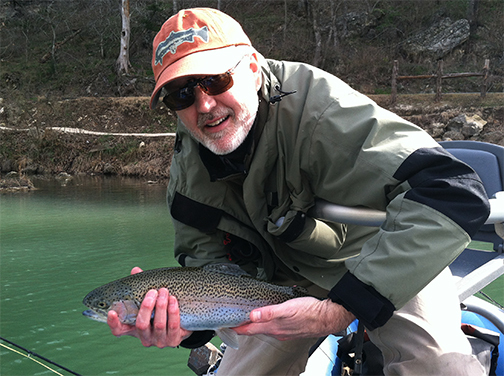 The Guadalupe River chapter of Trout Unlimited (GRTU) is the largest chapter in the nation. 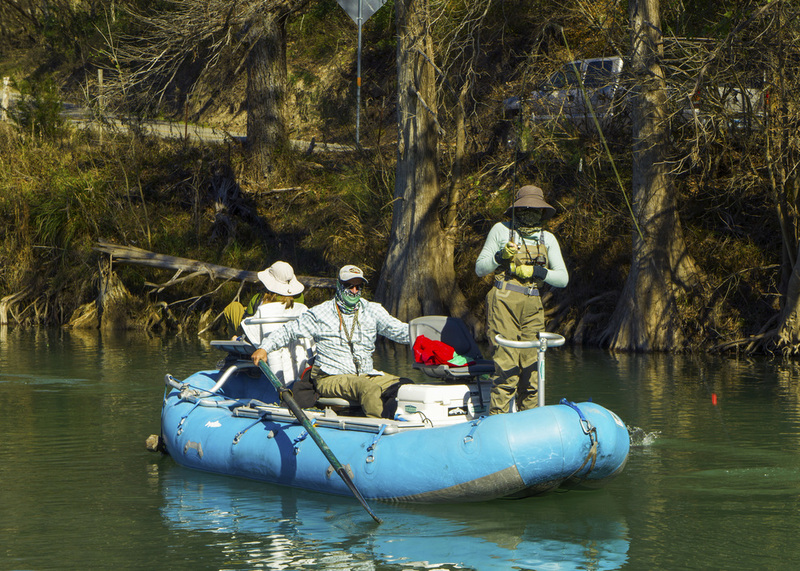 GRTU and Texas Parks and Wildlife stock the Guadalupe River from December through February. Most of the trout will average 12 to 14 inches but there are quite a few fish in the 18 to 20 inch range as well. 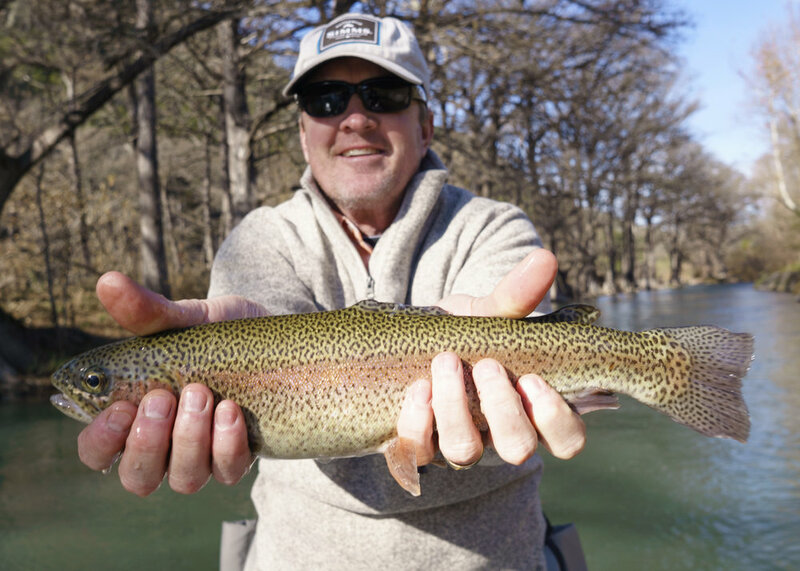 The guadalupe River is a very popular destination this time of year so fish during the week or when the weather is nasty to avoid the crowds. Colorado River bass fishing. 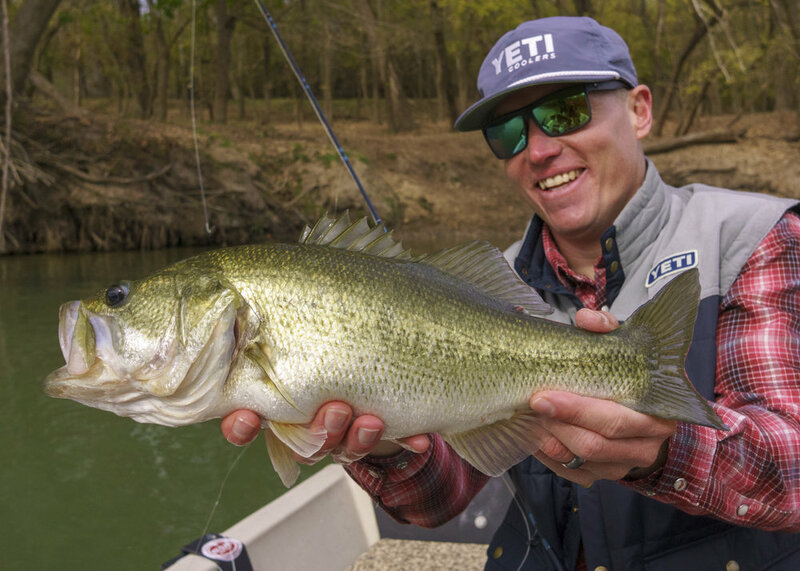 Even though bass fishing can be slow during colder weather, that doesn't usually last long in central Texas. Two or three warm day is usually enough to get the fish moving. 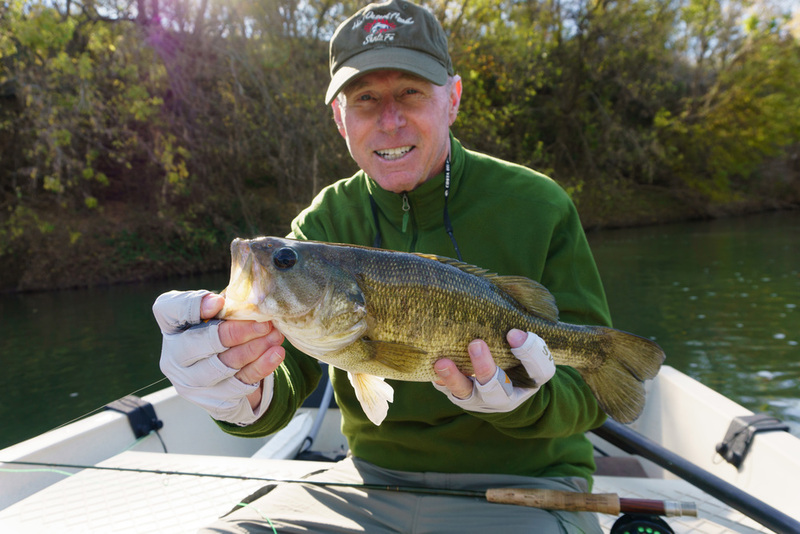 Bass fishing this time of year can be very rewarding. 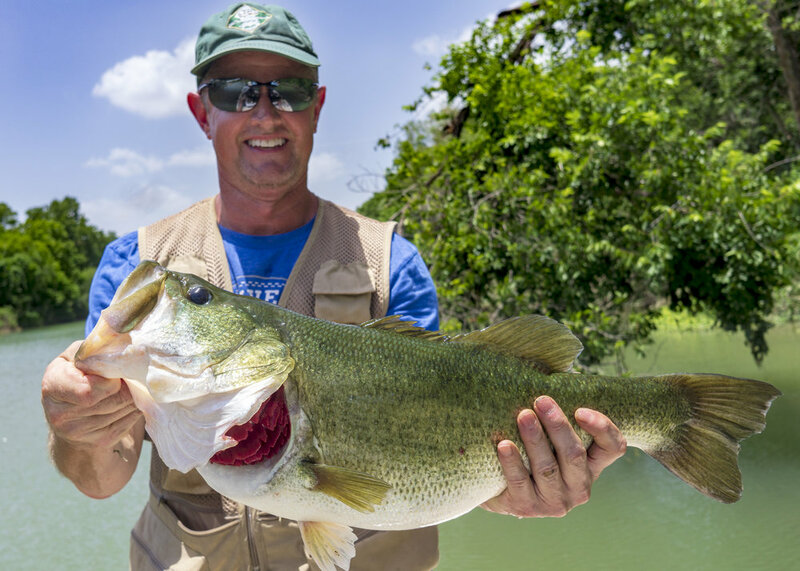 The current world record Guadalupe Bass was caught by one of our clients in February. 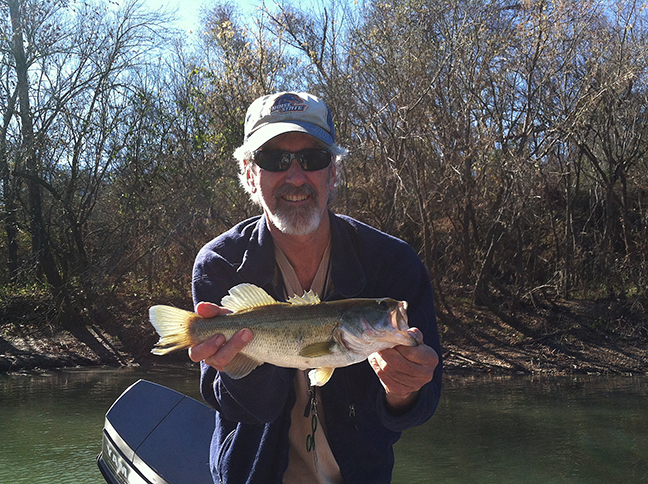 Several of us have caught bass in the 7 to 8 pound range this time of year as well. 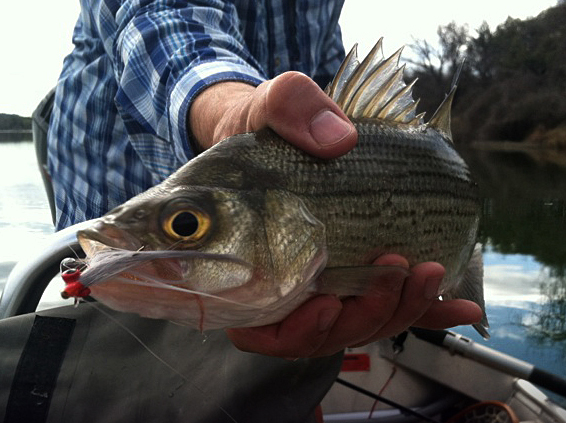 Other possibilities this time of year are large white bass, crappie and freshwater drum. You might also have a chance to see a bald Eagle, an otter or a beaver on the Colorado.The Colorado River is never crowded, especially this time of year. 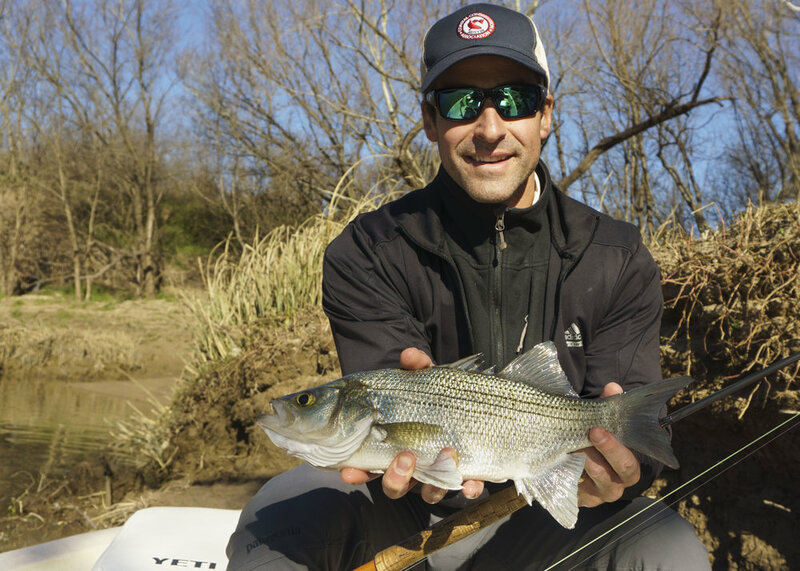 The White Bass run. 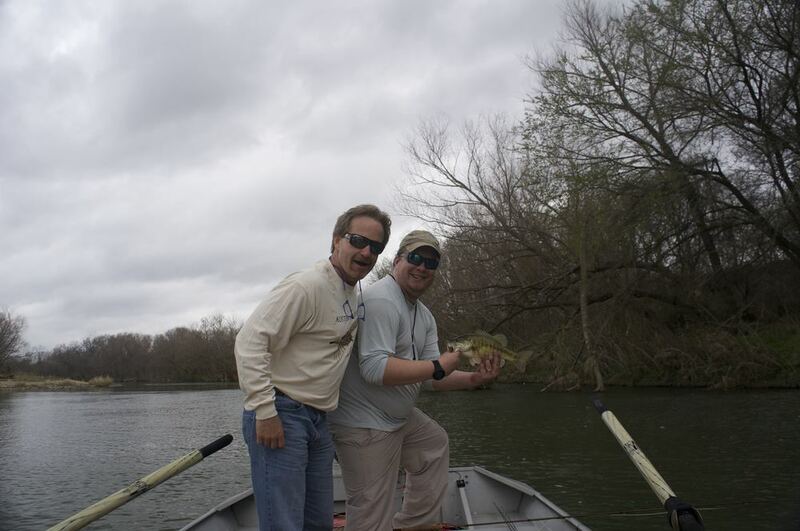 Central Texas has several great rivers with late winter early spring White Bass spawning runs. Although timing the run can sometimes be tricky, it is well worth the effort when you hit it right. It can literally be a fish on every cast. This year we will be running jet boat trips for white bass on the Llano River above Lake LBJ and the Pedernales River above Lake Travis. Other rivers may be added depending on water and fishing conditions. 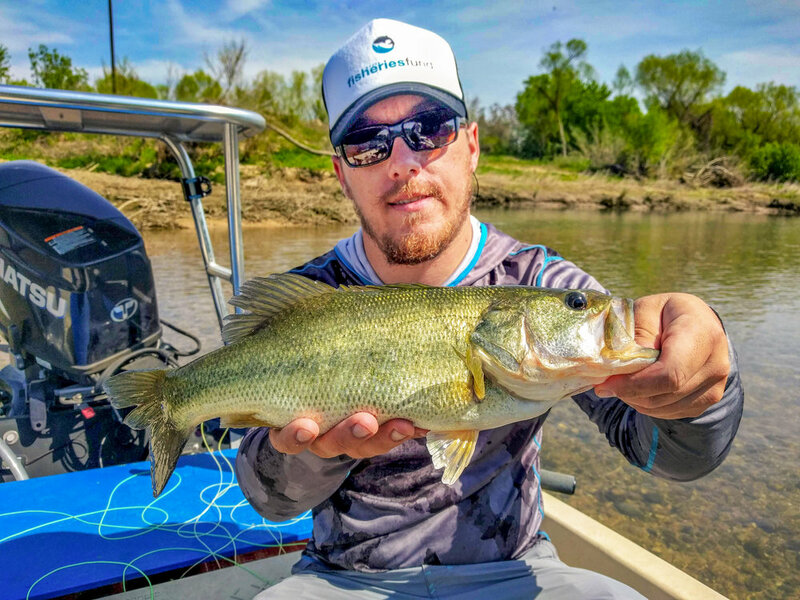 Despite the recent cold and rain we have still managed to catch some nice bass on the Colorado River. It has not been fast and furious but good enough to keep us interested. We have been catching some quality fish as well. 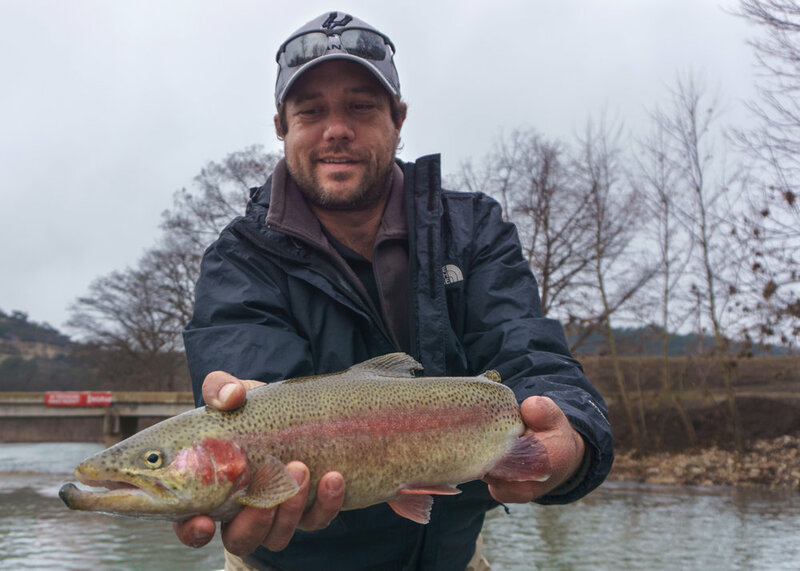 Winter is one of the best times to catch some of the biggest fish in the river. The current state record Guadalupe Bass was caught in the Colorado River in February a couple of years ago. As temperatures continue to cool, watching the weather will be important when planning to fish the Colorado River. After several warm days fishing should be pretty good. 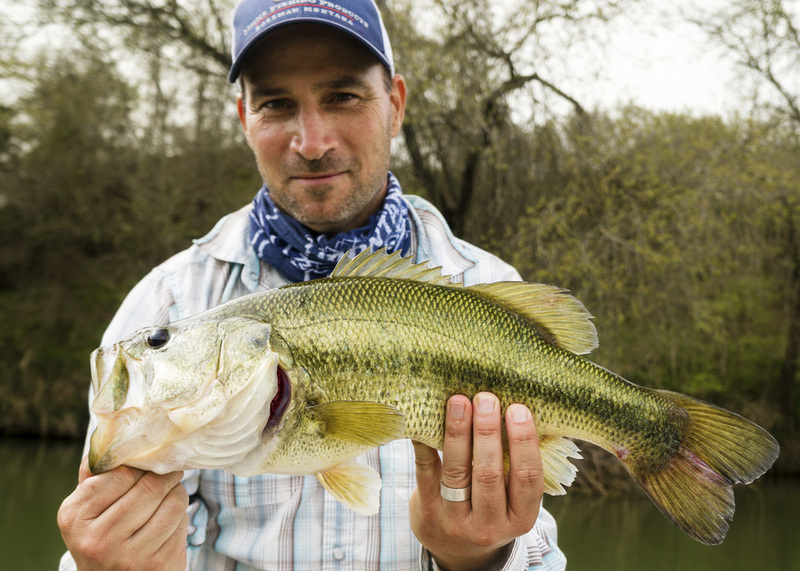 The slowest fishing will be right after a strong cold front. 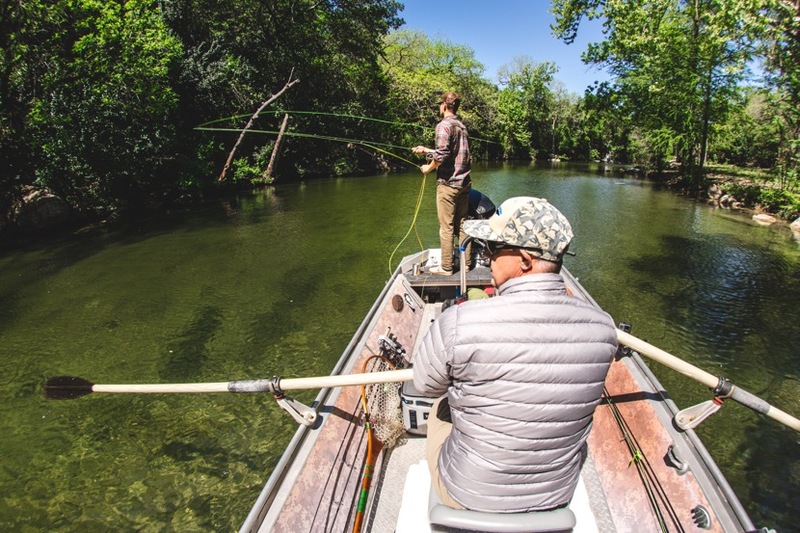 Springtime is always a welcome in the Texas Hill Country — the sites, the sounds, and of course the great fishing. This spring is no different except for the rain that has started to put a dent in this horrible drought that won’t loosen her grip. With the rain have come better flows or as I like to say, “new water” which seems to awaken the fish along with the rivers. Unfortunately, sometime this “new water” takes time to clear up before the fish think about eating streamers. 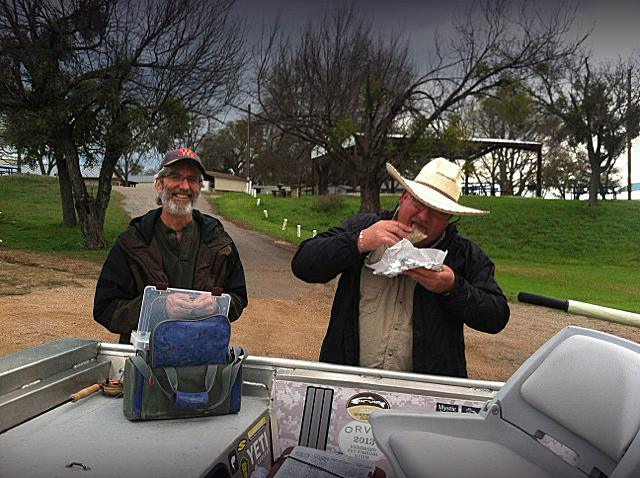 This cycle of good fishing, rain, muddy water, and waiting has taught us to be resourceful and patient. 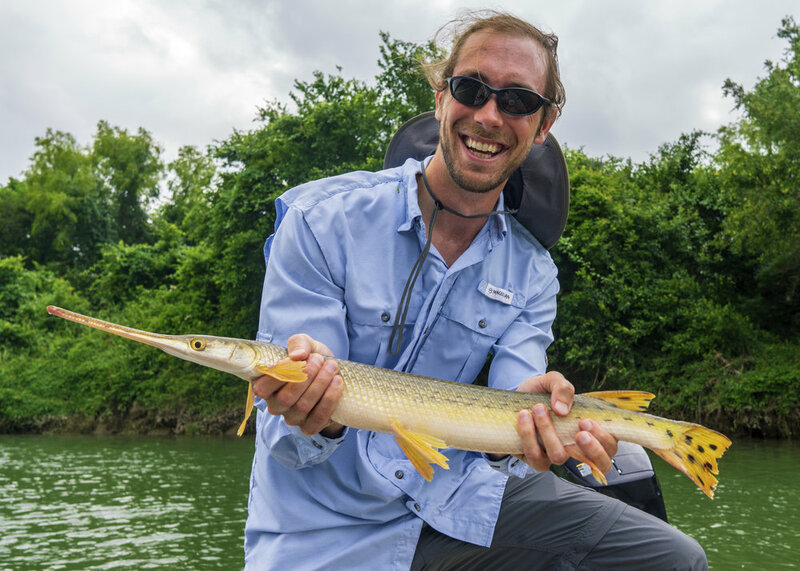 That resourcefulness paid off because we were able to to incorporate three rivers and three species of fish into three weeks of awesome fishing. 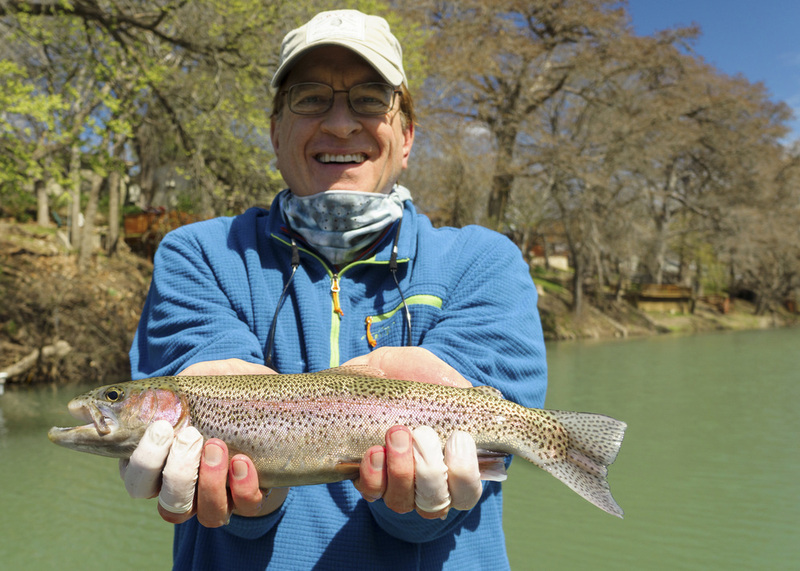 While the rains took the Lower Colorado River (LCR) out of commission we focused on species number one: rainbow trout on the Guadalupe River. 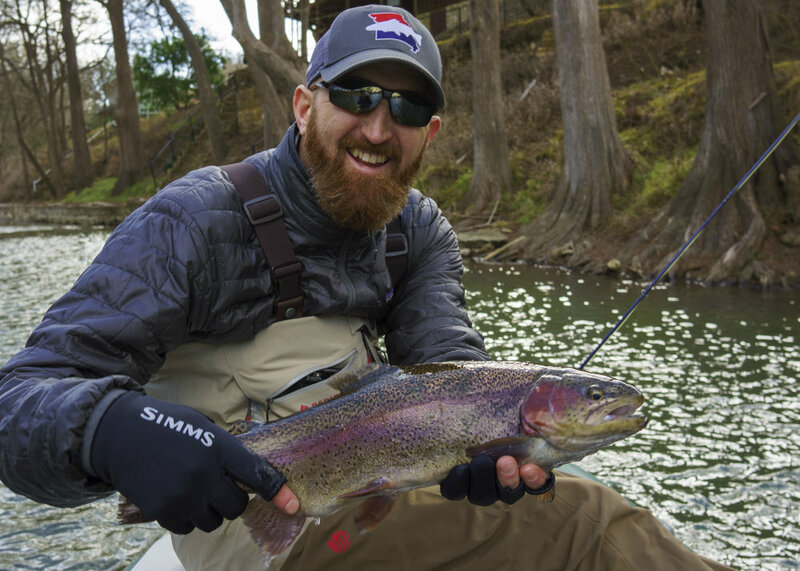 The Guadalupe River to fish well with good catches on midge patterns and sucker spawns. The fishing pressure is down so the fish are eating well and in great shape. On weekends we are starting to see the annual “tuber hatch” so planning a trip during the week is the way to go. 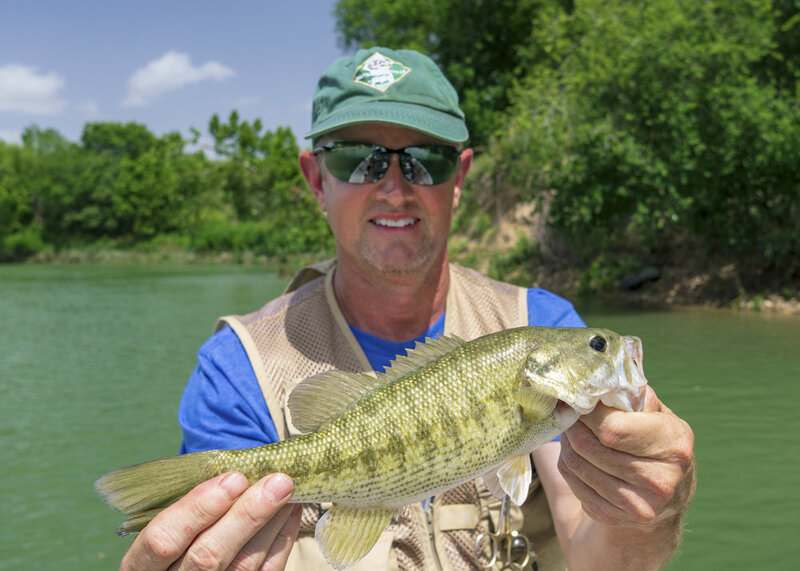 And if catching trout on the fly isn’t your thing than species number two might interest you: the annual Llano River white bass run is on for the next two to three weeks. 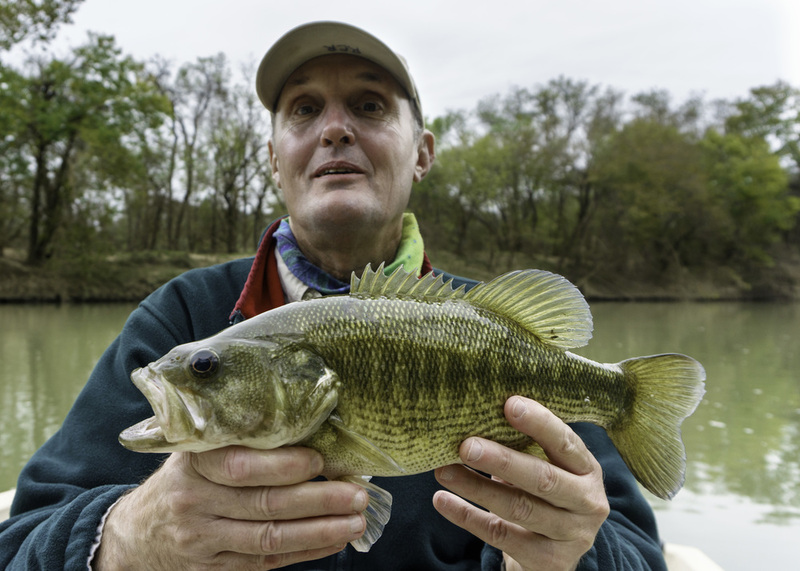 So far, every trip to the Llano River has resulted in clients catching double digits of white bass on Clouser Minnows and other assorted minnow patterns. 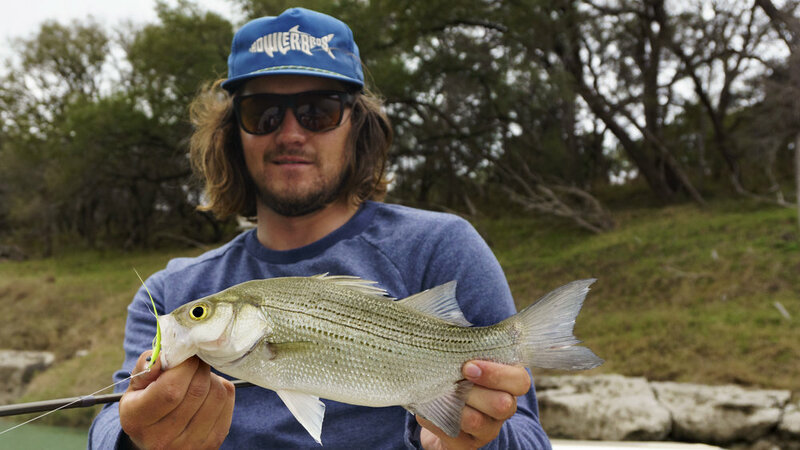 The white bass are leaving the deeper waters of the lower Llano at the mouth of the Colorado River and working their way up to the more wadeable waters upstream. 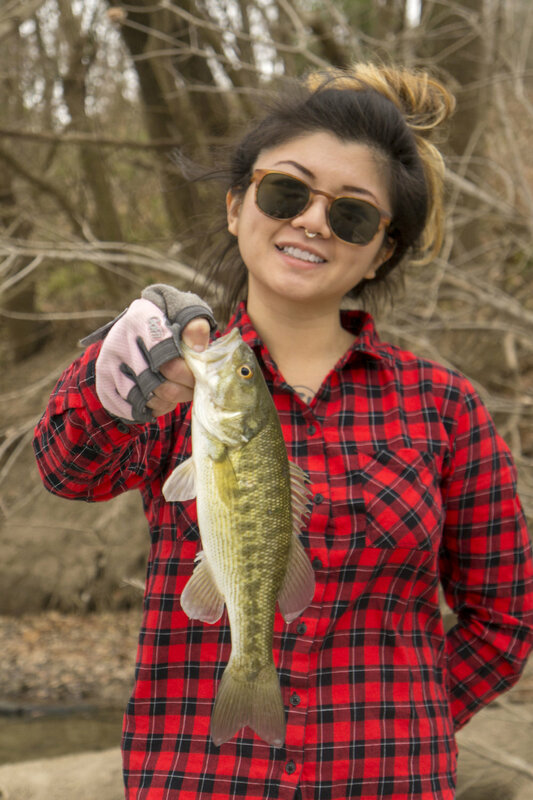 After a rainy start to our March the LCR had cleared up and we were concentrating on species number three: LCR Bass—largemouth and Guadalupe bass. 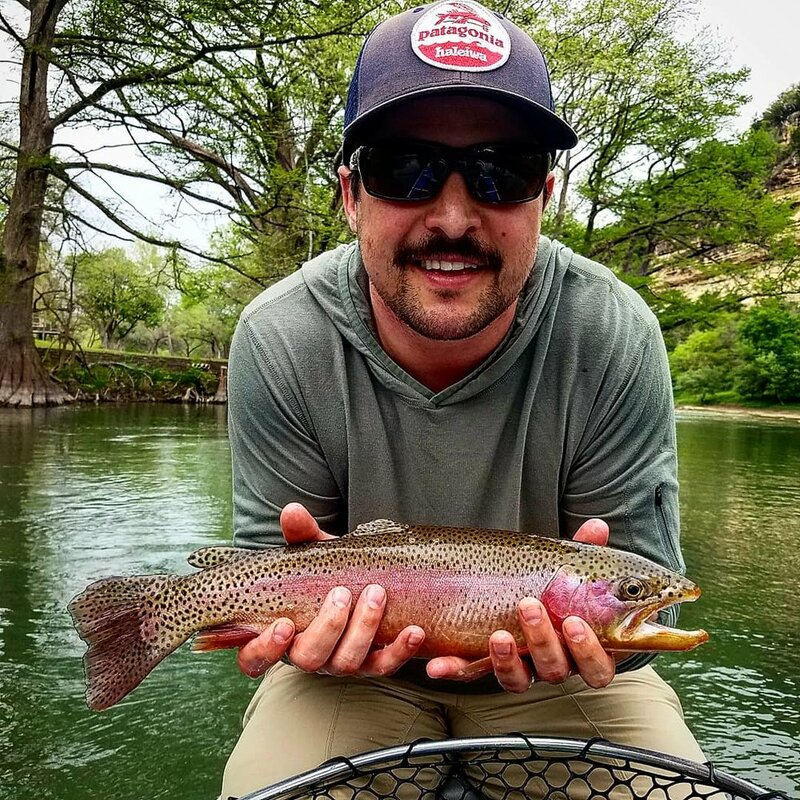 The fishing has been really good on the LCR and we are enjoying fishing with out of town guests visiting Austin for SXSW and spring break. 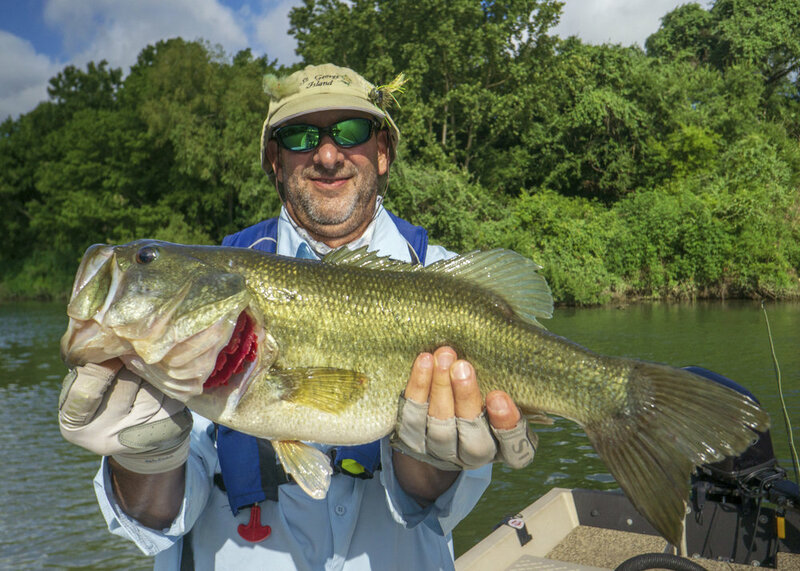 Though the subsurface bite has been good, we are starting to catch increasing numbers of nice bass on top. 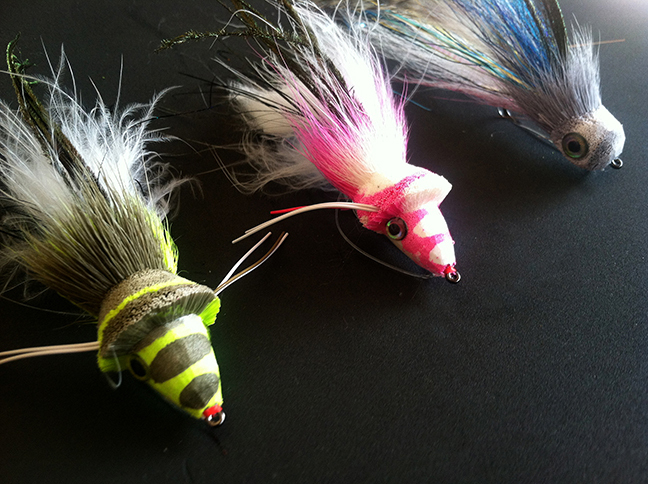 The big producer on top has been Cohen deer hair divers (www.rusuperfly.com) and assorted foam popper patterns. 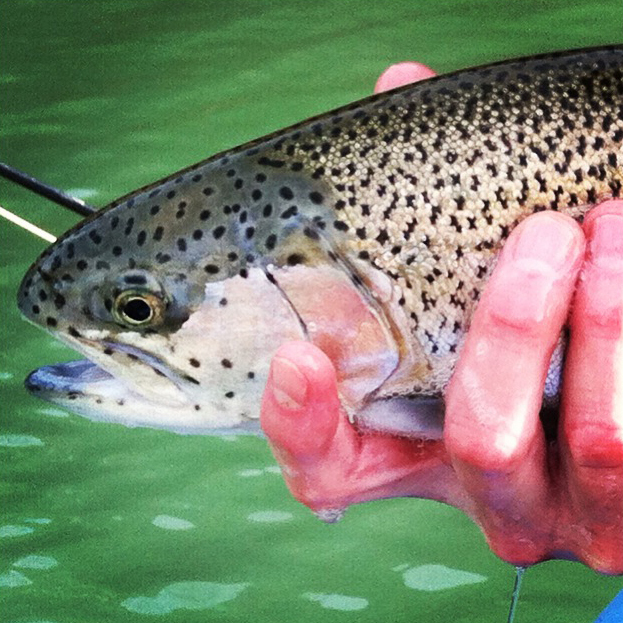 March and April are two of the best months for fishing the Lower Colorado. 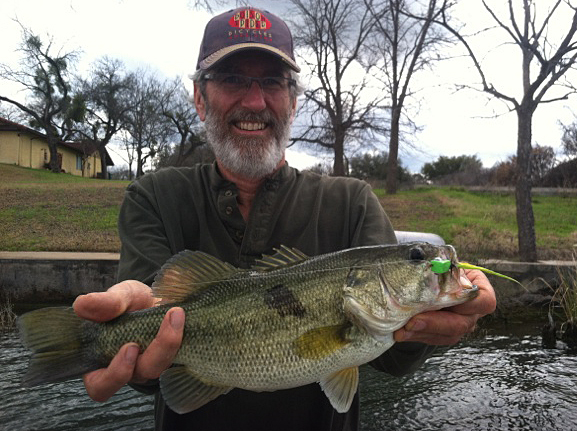 We have already caught several largemouth bass over 6 pounds and a near state record Guadalupe Bass. 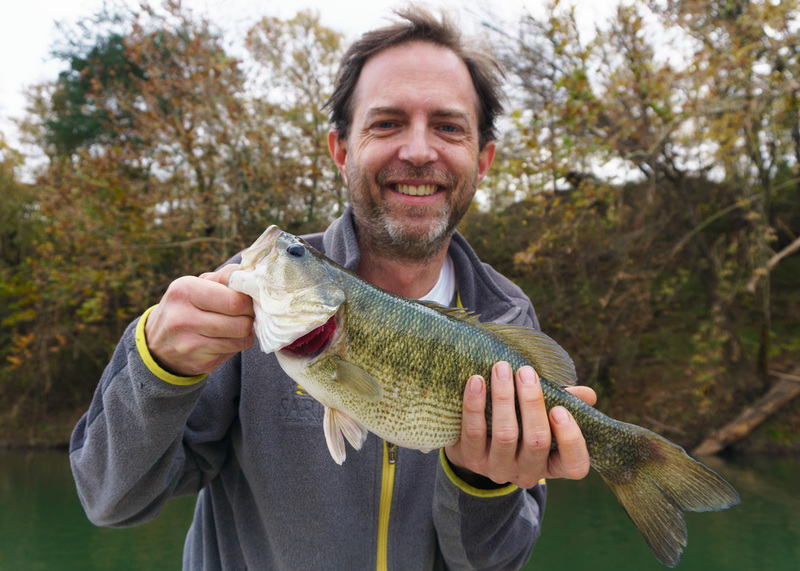 Fall has arrived in Central Texas and with it comes some of the best weather and fishing of the year. 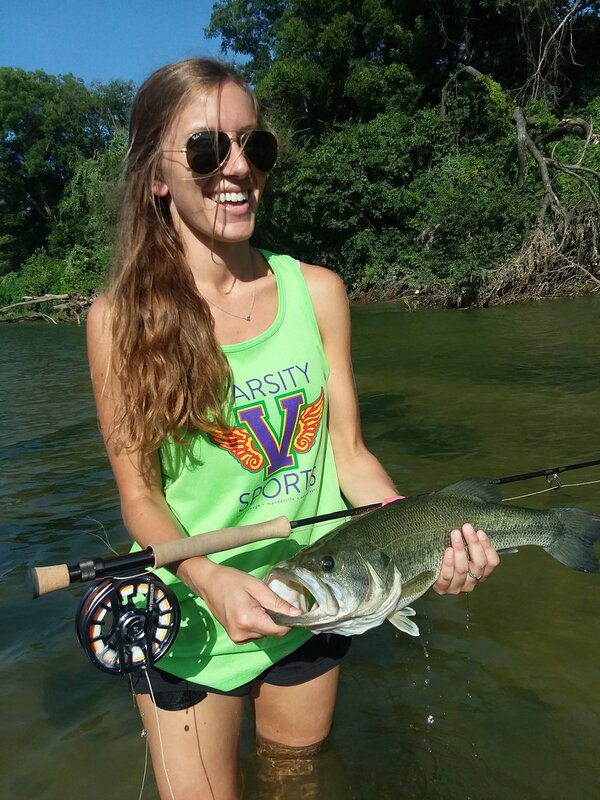 After a long hot summer, fall always gets us fishermen in a frisky mood. Luckily for us the fish feel the same way! 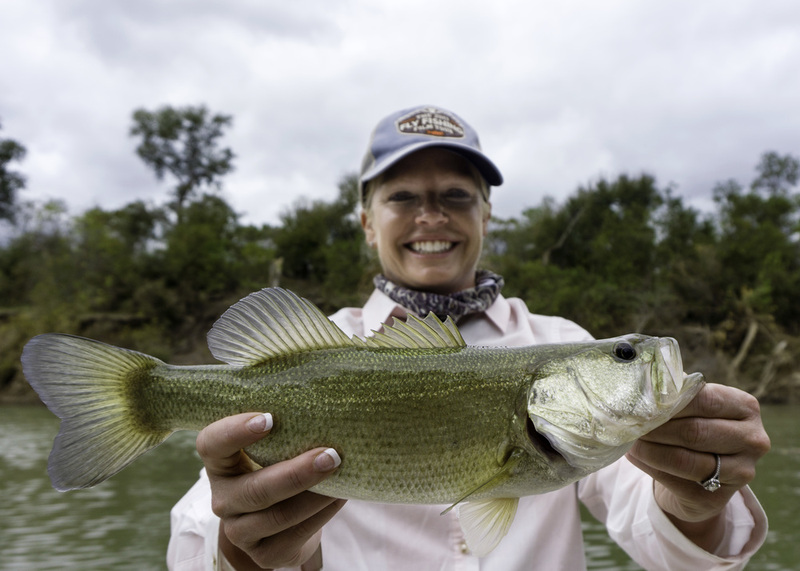 Cooler water temperatures mean some great bass fishing on the Colorado River below Austin. Right now the Colorado is cool and clear and after recent rains we have had good flows all fall that will most likely last into the winter. We are fishing close to 100 miles of the river and most of these sections of the river see very little fishing pressure. 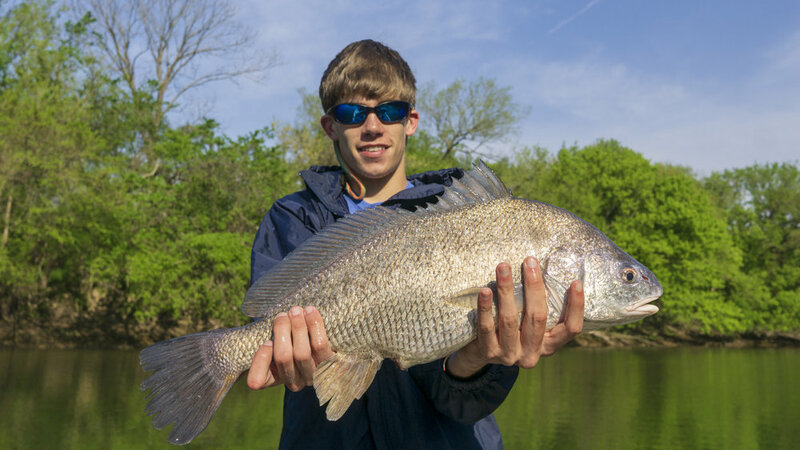 The Colorado River is home to some of the largest river bass in the state. 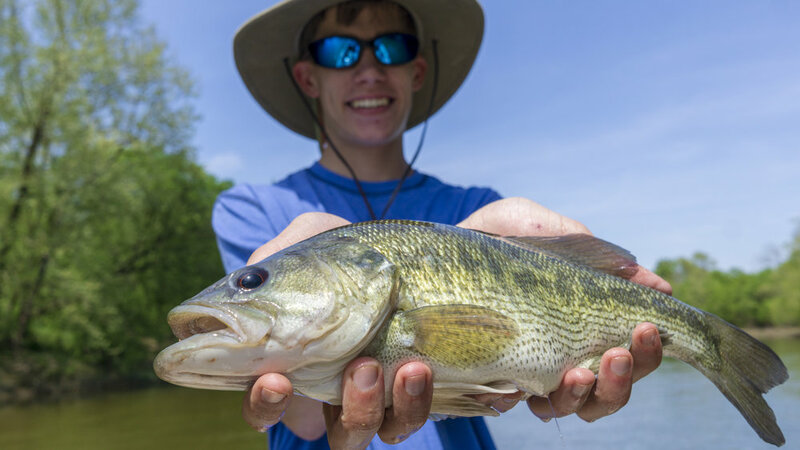 Catches of Largemouth Bass over 5 pounds are not uncommon. 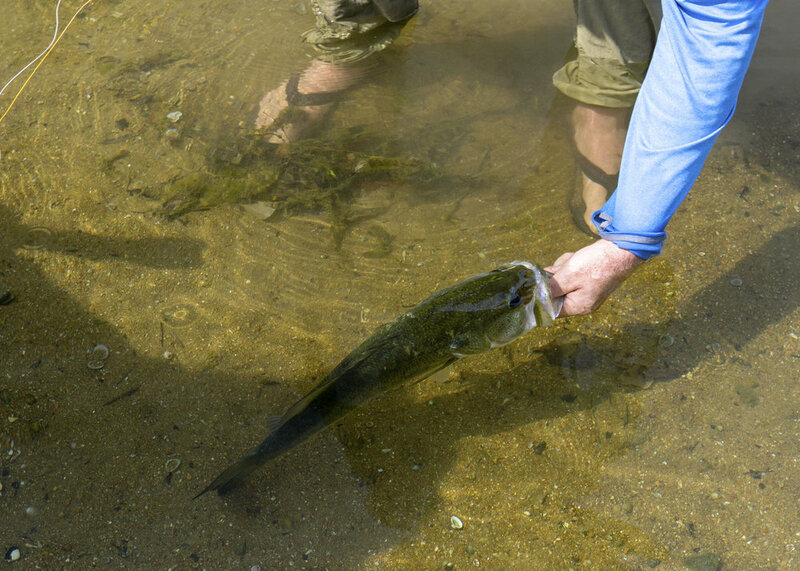 As water temperatures continue to fall, the numbers of Largemouth Bass caught will decline. At the same time the average size will increase. 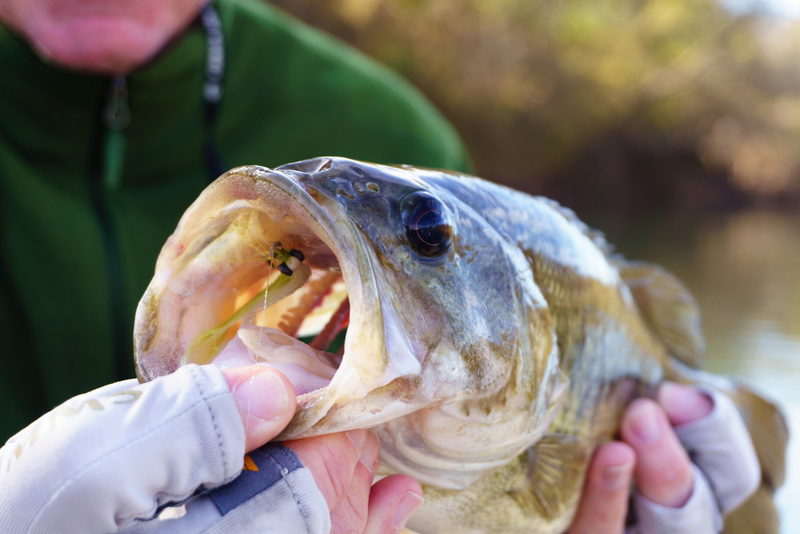 This time of year the best tactic for Largemouth bass is fishing slow and deep with big streamers or crawfish patterns. 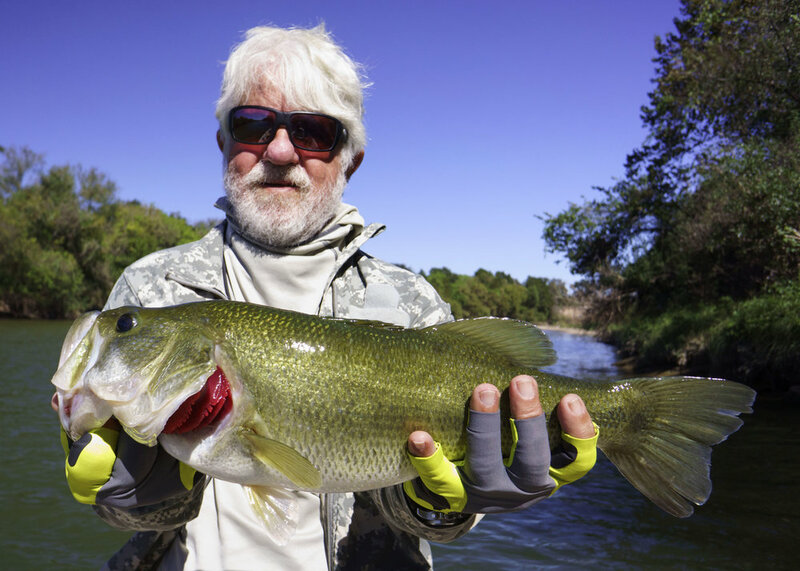 The Colorado is now hands down the best place to catch large Guadalupe bass. 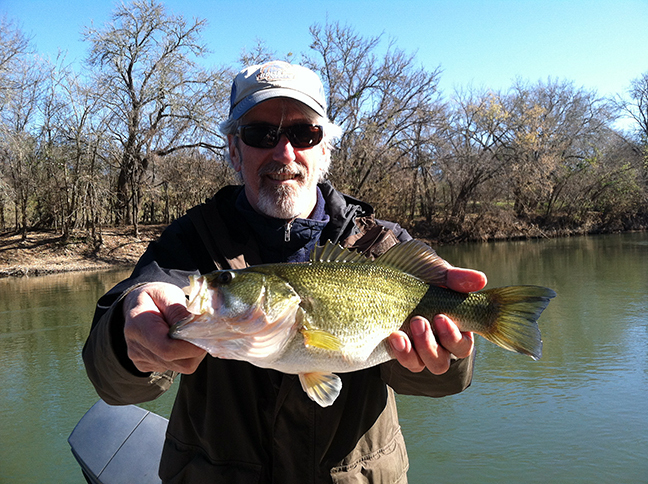 Last winter one of our clients caught the new state and world record Guadalupe Bass on the Colorado River. 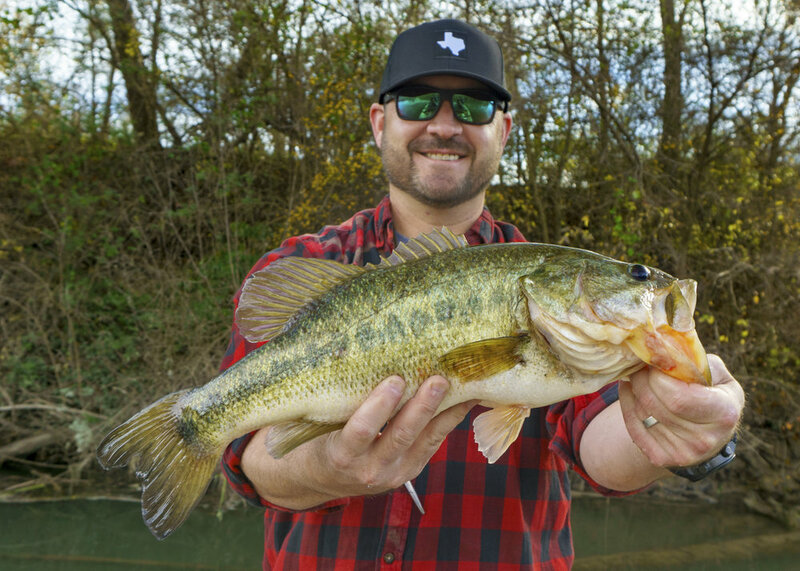 Fall and winter are one of the best times to catch a huge Guadalupe Bass. 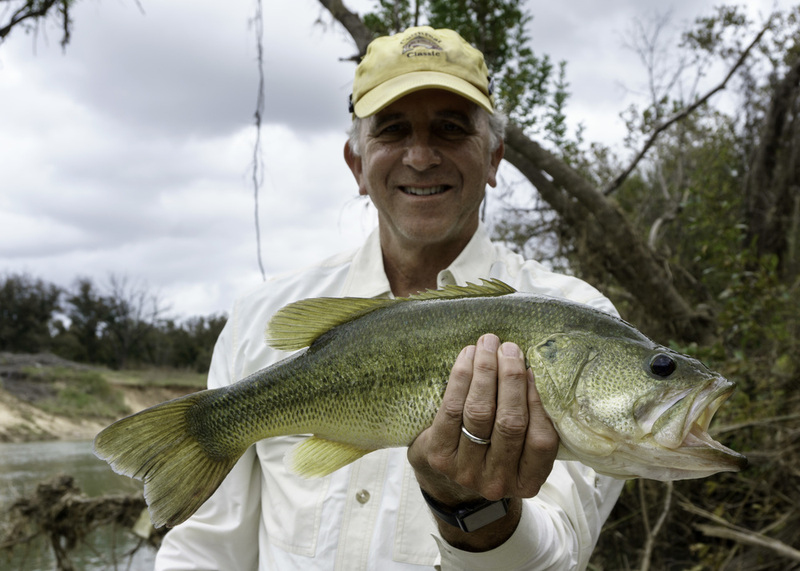 The same flies and techniques used this time of year for Largemouth Bass will work for the Guadalupe Bass. 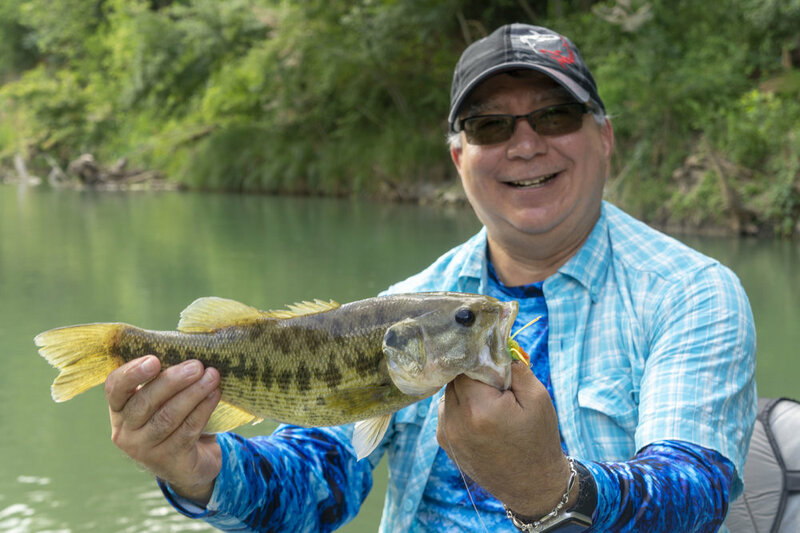 The Guadalupe Bass will usually be found in the faster moving sections of the river with more moving water while the Largemouth Bass prefer the slower water. Check out some recent pics of the action on the Colorado River. Well now that the boss is back from Vail I think it’s a good time to update the fishing report. 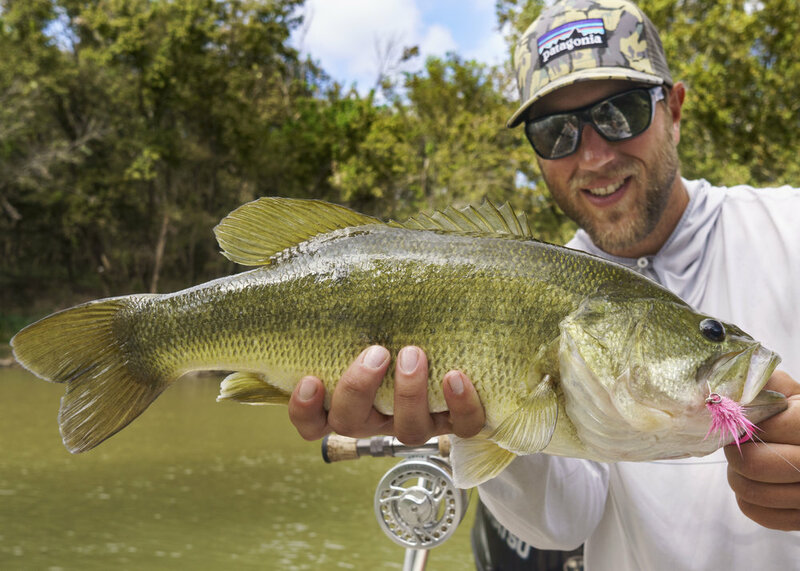 The dog days are upon us here in Central Texas and the fishing has been tough. With the summer heat comes warmer water, lower Do2 (dissolved oxygen) and lots and lots of vegetation. The fish get lazy. 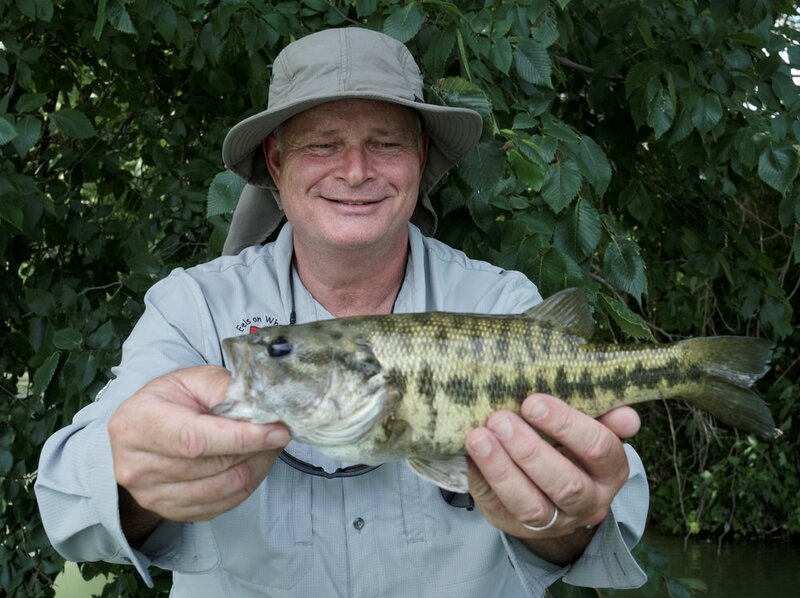 As it goes when its this hot we tend to do a little more fishing and less guiding. We’ve been sticking (or trying to at least) to half days having the best fishing right at sunrise. That said, it’s been really inconsistent as to when the fishing is good. I recently spent the afternoon with a friend for what was going to be more of a boat ride than a fishing trip as we both were locked in to other stuff till about 11 o’clock. What we thought was the absolute worst time to be fishing turned out to be a pretty productive mid day fishing trip instead of just a boat ride. 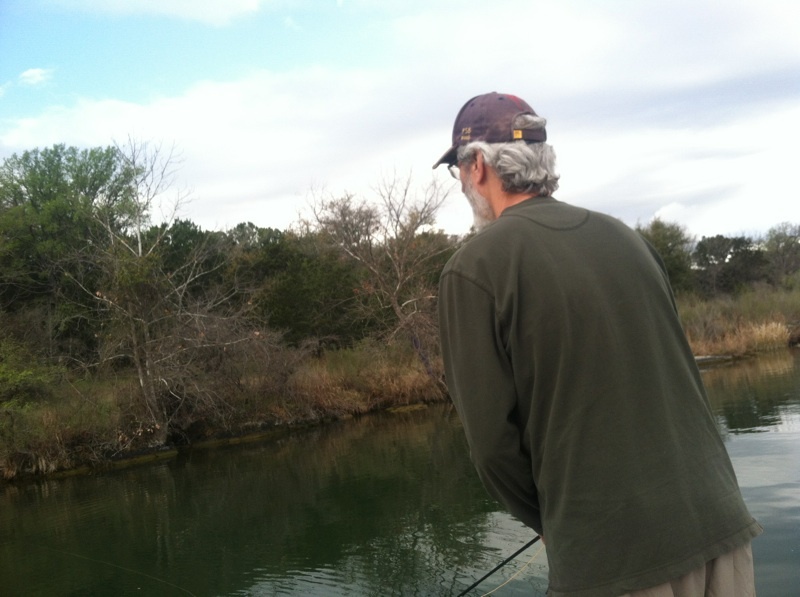 We’ve been spending our time on the San Marcos River and the Lower Colorado River as well as some of the local lakes. The Lakes have been productive for us and are a great “plan b”, when the LCR doesn’t look all that great because of the wonky flows and water clarity that is seen this time of year. 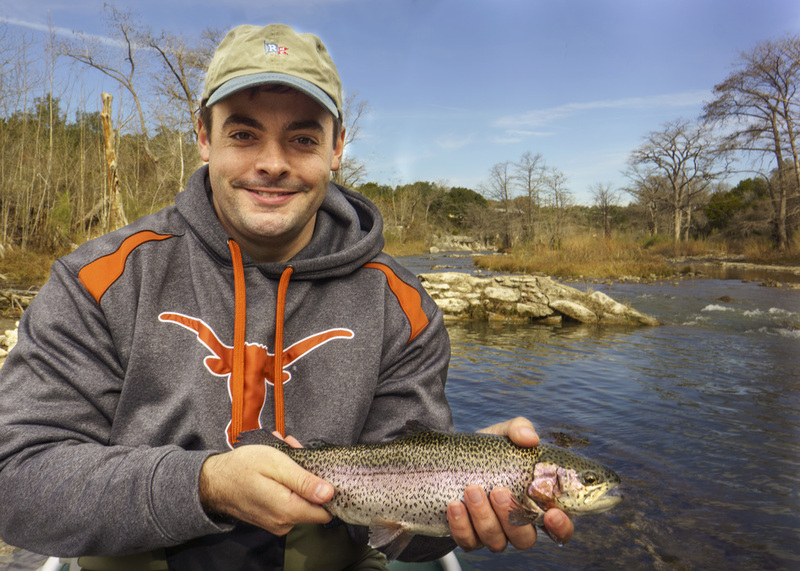 Fly fishing Bull Creek, Lake Austin. Austin, Texas. 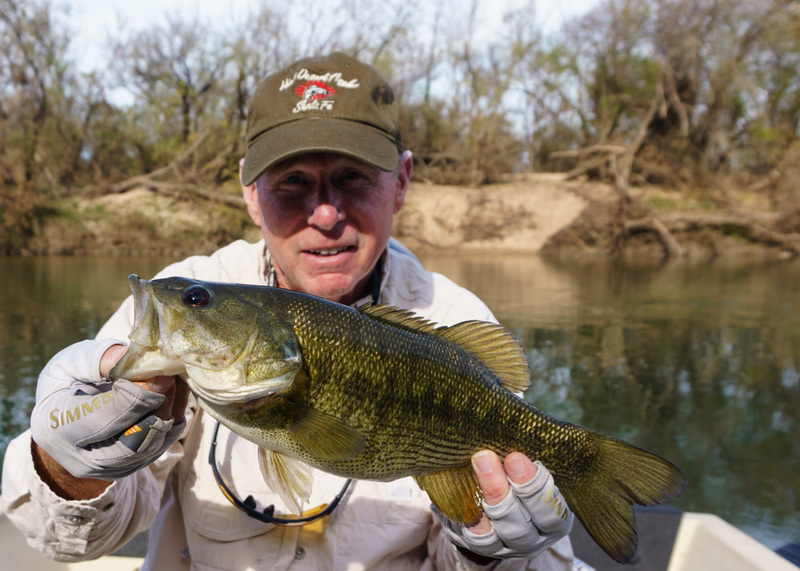 Fly fishing for Guadalupe Bass on the Lower Colorado River. Austin, Texas. Fly fishing for White Bass from the Lower Colorado River. We’ve also been all over the map on what’s been working. 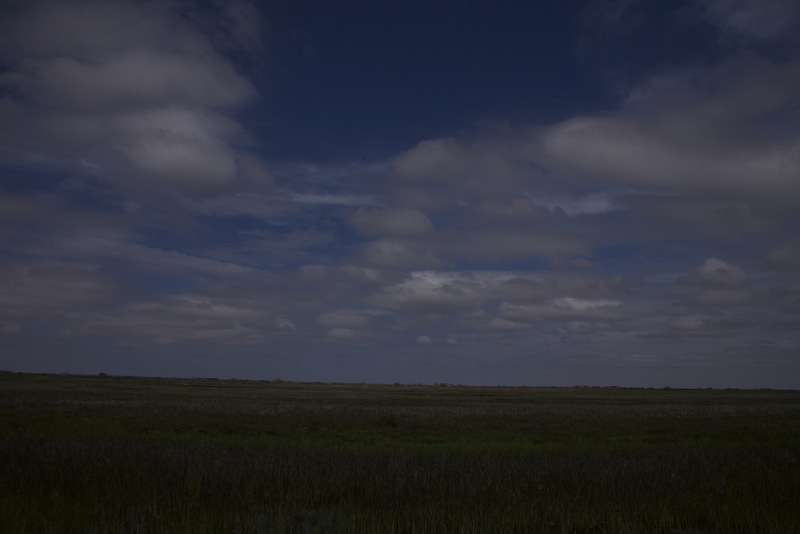 Surface and subsurface have both paid off without rhyme or reason. Needless to say we’re all looking forward to what’s just around the corner. We had an unbelievable fall last year and we don’t see any reason why this fall should be any different so book a trip now as were already filling up November. So, in a nut shell, It’s tough out there but we’re still catching fish. At least that's what the duck Hunters tell me as I'm backing my boat down to the water this time of year. "good luck" they say as if I'm out there to struggle through this horrible 60 degree winter day. My answer is always "we'll suffer through It". 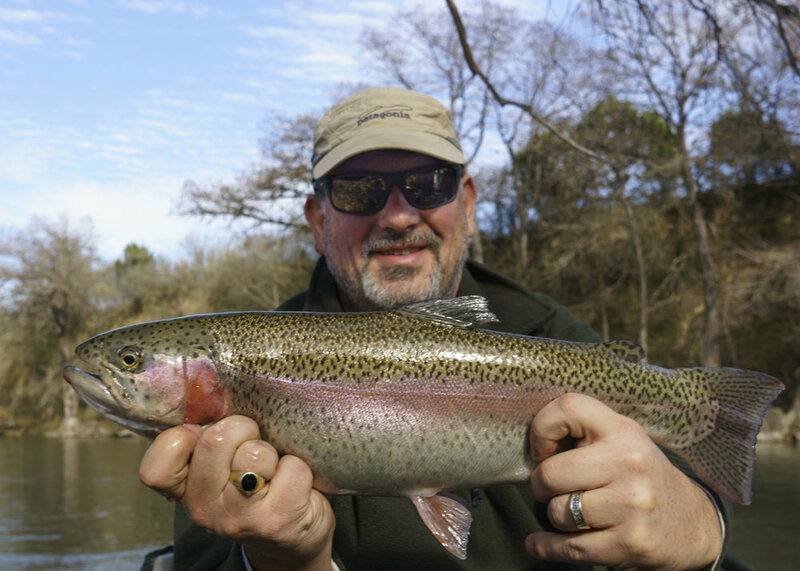 Typical trips this time of year are full day and we cover around 6- 8 miles depending on what section of the river is fishing best. This time of year you can almost count on not seeing another person all day, if that floats your boat. I will say this - when the water is low and clear and the temperatures warm up to the low 60s, there is no other place on earth I would rather be than the Colorado River. Old growth Poplar and Pecan trees line the banks creating a ribbon of reds, golds and orange. Mr. Great Blue Heron and always impressive Osprey are always there to greet you with a fly by. There is something special about fishing this river in the fall and winter. Maybe it's the size of the fish averaging around 3 lbs, or maybe it's the pure numbers once you realize you've caught over 15 by lunch time. Or is it the pleasant temperatures that require only a light fleece jacket to stay comfortable all day. In either case the splendor of the fishing can stay with you for months. We at All Water Guides would love to show you what winter "Hunting season" looks like. It’s beginning to not feel like Christmas — and we’re okay with it! December rang in with a flurry of freezing cold weather, which should have shut down our bass fishing. 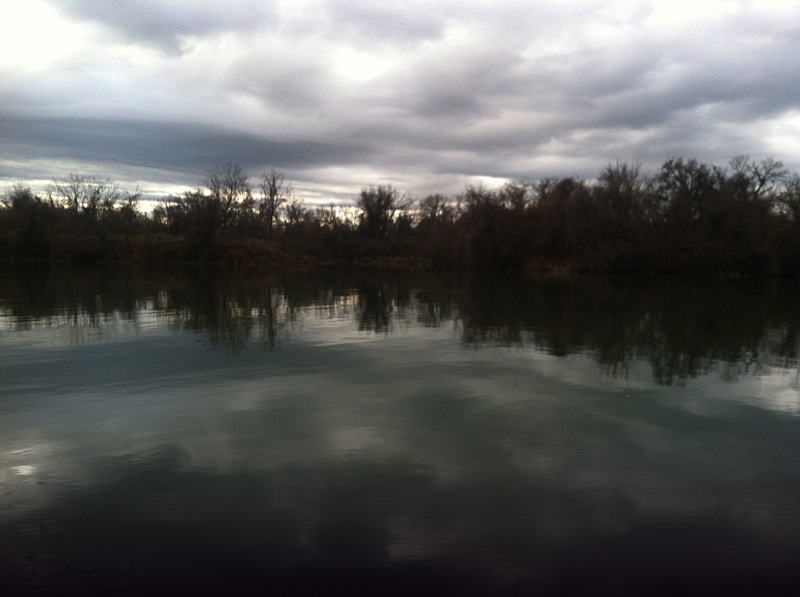 But in spite of the recent cold weather, the Colorado River fishing is still going strong. 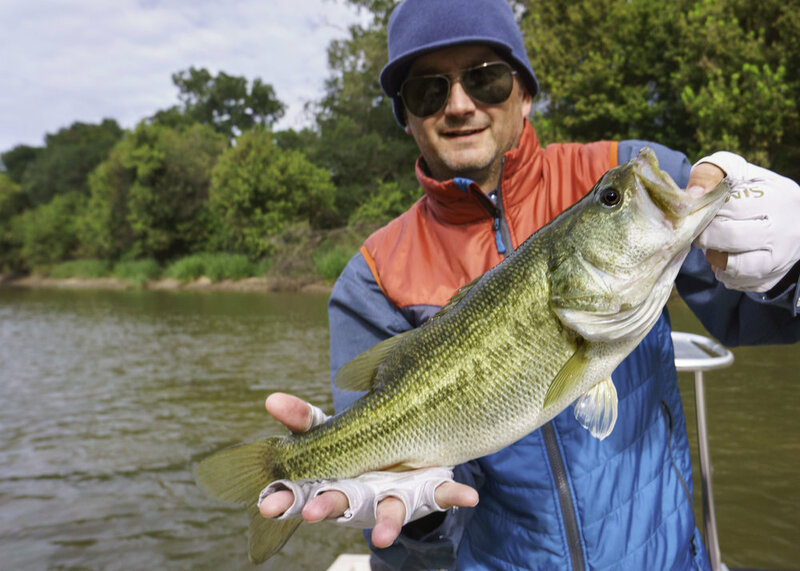 The last few days have been some of the best this fall with clients catching good numbers of quality bass—including white bass over 2 pounds, Guadalupe bass up to 3 pounds and largemouth bass to 5 pounds! 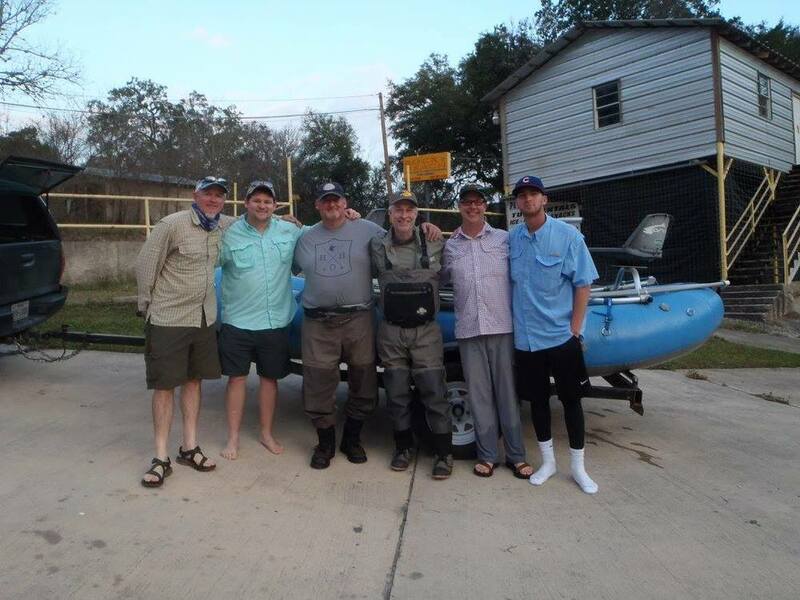 The craziest catch of the week was by angler Tyler Reisig who caught a huge (40lb.) Smallmouth Buffalo (Ictiobus bubalus) that pulled the sledsled around for about 20 minutes. The water clarity is perfect at about 3-feet and will only get clearer throughrout the winter. 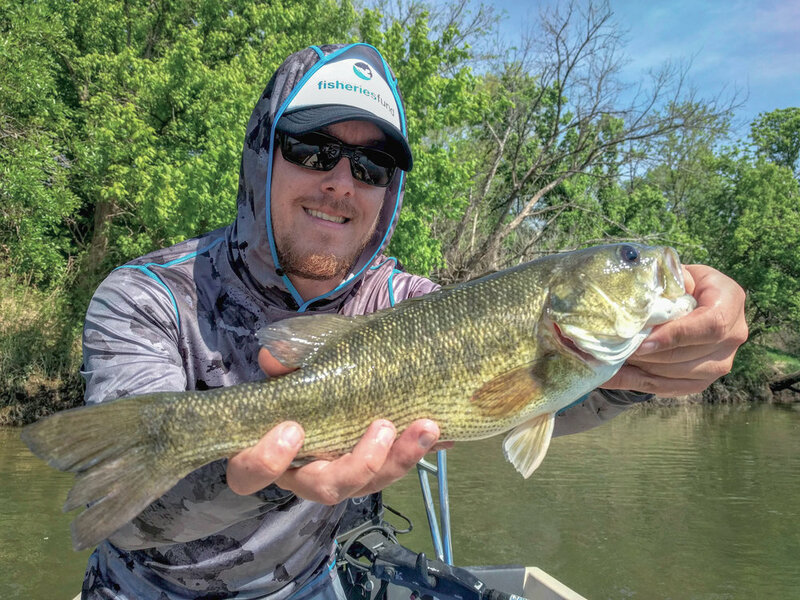 Even though the temps have been colder than normal, recent warm weather has the fish turned on to chasing small minnows. 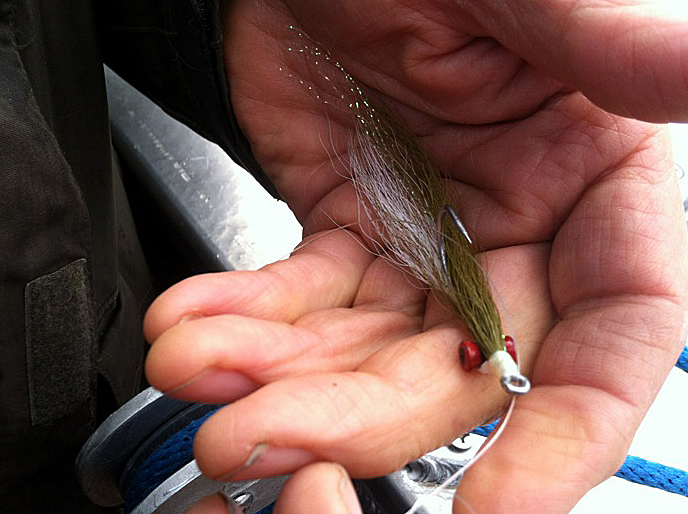 Sub-surface patterns like Clouser Minnows and crawfish patterns are the most productive right now. The weather looks good for the rest of this week until the next cold front hits just before Christmas. If you are thinking about fishing the Colorado River now is the time. And don’t forget, All Water Guide’s gift certificates make the perfect stocking stuffer!